It was something that the archbishop had been considering for a while. Offering sanctuary to dispossessed and distraught refugees was something that he felt passionate about. There were refugees desperate for sanctuary from war-torn places, and the archbishop himself was completely torn about their situation and wanted to make a difference. The rent for the refugees would be paid for by charitable funds under the archbishop’s personal control. 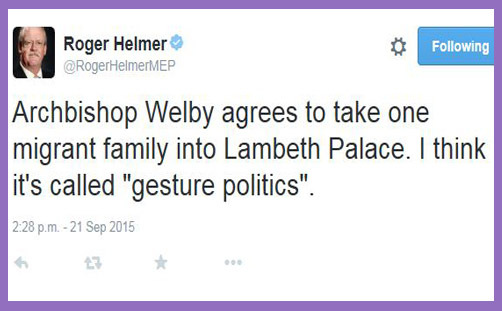 So he made arrangements for his palace to welcome the refugees. There was a Christian politician who loved to read The Express and watch Fox News. He saw that his brothers and sisters in Syria were being attacked, abducted, tortured and killed. He loved patriotism, sovereignty, democracy and civic duty, and said, “Christian moral principles are not a bad basis for a free and fair society.” He heard about the archbishop’s offer of sanctuary to refugees, but preferred to call them migrants, even though they were being rescued directly from a place of fierce persecution and torment. “The suffering there is great, but the archbishop is only helping one family,” he said. “This is pure gesture politics; a cynical display of virtue-signalling; showing off to the nation about how good and righteous he is.” The Christian politician was concerned about spiritual integrity and the appearance of hypocrisy. He prayed to his Father in heaven, and was moved to anger. Hypocrisy was something he felt passionate about. And there were many poor and homeless on the streets of his own country. Why, he wondered, was the archbishop not dedicating his considerable funds and offering refuge to them? “Charity begins at home,” he said. And he logged out of Twitter, turned off his PC and went to bed with a mug of Horlicks. The spare rooms in his mansion remained empty, and the spare beds unslept in. Which of these two did the will of his father?